Today is the first day of fall, and although it's a beautiful season, many dread the season coming after so much that they don't stop and enjoy all the beauty of the fall season. But we want to bring back the fun of fall, with these three great ideas for anyone with a birthday during this season! The County Fair brings to mind fun games which are great for a birthday party! Ring toss, bean bag toss, bobbing for apples or throwing balls at tin cans are a few fun ideas. You can even set up a photo booth for some great keepsakes. To bring home that fair feeling, think picnic and country! Use red and white checkered tablecloths, napkins and plates. Set up game stations using wood crates or barrels. Display ribbons everywhere, and hand them out as prizes. 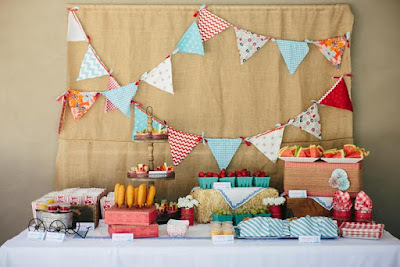 You have so many ideas to choose from to bring that County Fair feeling to the snack table! How about corn dogs or hot dogs, corn on the cob, small buckets of popcorn, fresh fruit, cotton candy, soft pretzels, cinnamon and sugar twists – and of course yummy pies! Have plenty of inexpensive prizes on hand for each of the games, give each guest a paper bag to keep their prizes in. Adding cotton candy into sealed containers makes them easy to take home for a treat, and it keeps sticky hands away from the party. A bag of caramel popcorn is also a great parting gift. Small jars of soap bubbles will bring the fun of the party home! Let the kids decorate their own pumpkin! You can use miniature pumpkins with stickers for the younger kids, or carving tools for the older kids. Or use Styrofoam pumpkins and paint and let their creativity really come out! For the really little ones, arrange wagon rides. If you have access to lots of hay bales, and more space, why not set up a hay maze for the older kids? Other ideas are pumpkin colouring pages or face masks, or custom made bracelets/necklaces using fall coloured beads. If the weather cooperates you can set your pumpkin patch scene in your backyard or a park. The trees in their fall beauty will make the perfect backdrop. If you need to keep your party indoors, use garlands of fall leaves to set the tone. Set up a picnic style table and use hay bales covered with flannel blankets. Use as many pumpkins as you can find spread out to really bring home the feel of a pumpkin patch. Not-so-scary Scarecrows will look great too! If you’re feeling creative, make a pumpkin shaped cake! But cupcakes with orange frosting, or cake pops will work just as well. Pumpkin pie, pumpkin shaped cookies and candy apples are all perfect fall inspired snacks, as aretheseawesome Rice Krispie pumpkins! Apple juice is great for that fall feeling, or if it’s a bit chilly – hot chocolate! Everyone gets to bring home their decorated pumpkin of course, as well as any other craft from your activities! You can also use some ideas from the snack section as party favours. Just wrap the candy apples in some cellophane and they become the perfect take-home-gift. Small bags of pumpkin shaped candies will also work. 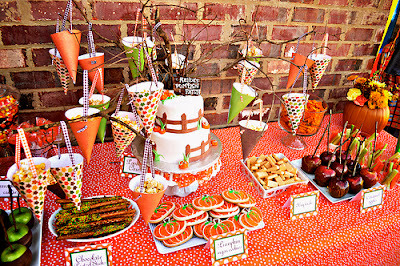 For those with a birthday closer to Halloween, the holiday lends itself to a great birthday party theme. You can even stipulate that all guests wear costumes for extra fun. Then let the guests decorate Styrofoam pumpkins into Jack-O-Lanterns, or let them decorate their own pumpkin or ghost shaped sugar cookies with orange frosting and sprinkles. Another great idea is to put different foods in bowls and let the blindfolded guests put their hands in. Some ideas for foods to use: peeled grapes (eyeballs), cold cooked spaghetti (brains), canned spinach (guts), gummy worms in pudding (intestines) and so on. Use any Halloween decorations and make it less scary or more scary depending on the age of the birthday child and guests. Jack-O-Lanterns are a great addition, as well as draping fake spider webs all over the room. Use black and orange balloons to anchor the classic Halloween colours. 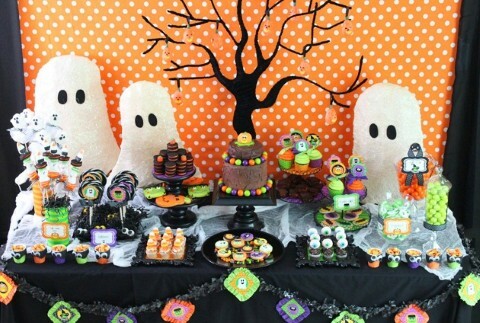 decorated with spiders, cupcakes with ghoulish decorations and orange, black or purple icing, or black and orange cake pops would all be a big hit. Create mummies out of wieners and pig-in-a-blanket dough, cut into strips and wound around the wiener. Sandwiches can be cut into ghost shapes or other Halloween creatures. Create ghosts out of marshmallows, or halved bananas (using chocolate chips for eyes and mouths), and make spiders out of Oreo cookies (add pretzel sticks for legs and use icing to fasten orange candies for eyes). For a spooky drink, fill a plastic glove with water and freeze, then add to a bowl of fruit punch. This theme is probably one of the easiest to find party favours for. Around Halloween there are so many toys and trinkets around. You can find flashlights, necklaces, masks, rings and all sorts of ghoulish gifts. If your activities included decorating pumpkins and cookies, those will go nicely in the loot bag too. Small bags of candy corn is a great idea as well. Instead of your usual bag, place the favours in small Halloween buckets or pumpkins which can later be re-used for trick-or-treating.